Patricia Quinlan Albertson, age 95, died Wednesday, May 30, 2018 in Kalamazoo at the age of 95. She was preceded in death by her husband Eugene R. Albertson in 1988. Patricia was born on May 2, 1923 in Cleveland, Ohio to Mary (Hartnett) and John Webster Hadlock. She was a REAL Daughter and a member of the Daughters of Union Veterans of the Civil War (DUVCW). Patricia graduated from St. Vincent Academy in Albuquerque, NM in 1941 and she received a BA in sociology in 1945 from Nazareth College in Kalamazoo. She married Eugene R. Albertson on January 15, 1949 at St. Augustine Church with the Most Reverend William Murphy, Bishop of Saginaw officiating. Patricia worked at St. Agnes Foundling home, placing infants in adoptive homes and was later a foster mother for children waiting adoption while raising four children of her own. Patricia subsequently worked for 18 years at Borgess Hospital. She was a member of St. Joseph Catholic Church for 65 years and a volunteer at Loaves and Fishes food pantry for 20 years. Patricia was grateful for the loving care of Rita Albertson, Lori Hite, Kay Sanford, Jeannie Brink and Ethel Reno. 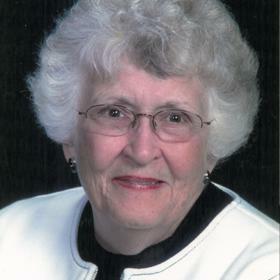 A full obituary for Patricia Albertson was published online by Life Stories Funeral Home.